UPDATE: Topps has confirmed that all 10,000 Blue Wave Refractor packs have been claimed. 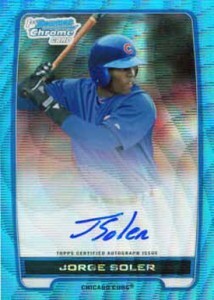 Don't throw out your empty 2012 Bowman Chrome Baseball packs because Topps has confirmed another wrapper redemption. For every 36 wrappers, collectors receive a pack of five exclusive Blue Wave Refractors. Both hobby and retail packs are eligible and can be mixed. 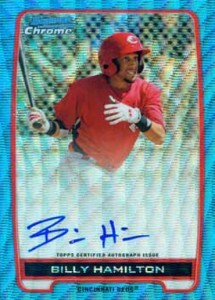 A total of 110 different Blue Wave Refractors parallels are part of the 2012 Bowman Chrome Baseball wrapper redemption. Collectors can also look for random autographs. Signers include Billy Hamilton, Jorge Soler, Ronald Guzman, Shawon Dunston Jr. and Tyler Austin. Blue Wave Refractor packs are limited to 10,000. Households are limited to five packs. Also, any packs postdated before the set's official release date, October 17, do not qualify. 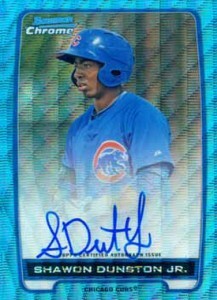 So even if you find 2012 Bowman Chrome Baseball early, be sure not to send your packs until the set's officially out. If redeeming for multiple packs, collectors are encouraged to bundle their wrappers in a single envelope. The 2012 Bowman Chrome Baseball wrapper redemption is available while supplies last. Topps said they will update collectors on remaining packs on Twitter. Has there been any news yet on what the additional redemption will be? john heinz � Which redemptions are you wondering about? All of the Blue Wave wrapper redemptions have long since been claimed.